If you haven’t been to Whisper Chocolate, this is your chance! Opened in a little over a year ago by the mother-daughter team of Linda and Jasmine Mead, they combine European and fair trade organic chocolate with local ingredients to create one-of-a-kind confections. Soon after opening, Linda was diagnosed with a brain tumor. Since then, the Meads (joined by Linda’s brother Jim Meaney) have overcome numerous obstacles to create a successful business here in Geneva. So stop by and see what they have to offer — from small selections of individual chocolate treats to larger chocolate collections — and give some love to one of Geneva’s newest businesses! 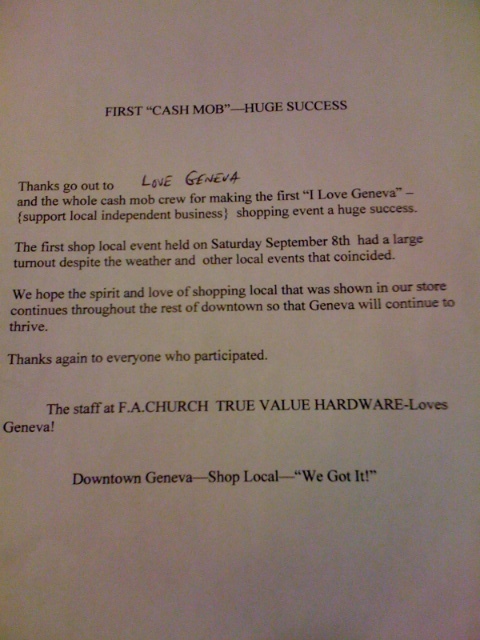 Thanks to everyone who made it out to LOVE GENEVA’s second cash mob. Lake City Hobby and Toys reports that it was a “tremendous success.” With well over a hundred people making relatively small purchases, the store had a “really great day.” They also note that there was a palpable level of enthusiasm and community spirit, which is just great. So THANK YOU all. The next cash mob will be held on Saturday, October 6th — the target of which will be announced at the end of this week! Also, don’t forget the T-SHIRT COMPETITION!! So come out on Saturday, Sept. 22nd at any point between 11am-1pm to Lake City Hobbies. Meet other Love Genevans. Buy an item! It can be as small as a kite or comic book, or as big as a model train set. If a hundred people show up during the cash mob and spend $5 each, that will bring in $500 in just two hours! Believe us, they will be extremely grateful for your patronage and support. The last one was a huge success, so let’s keep it up! Love Geneva – and it’ll love you back! OK, only one requirement. Beyond that, the sky is the limit! Be creative! Feel free to include one of the taglines we use — “Shop Local” or “Support Local Independent Businesses” or “It’ll Love You Back” — or come up with one of your own; or don’t use a tagline at all. Winners will receive two free t-shirts, plus pride in seeing their design all over town. The deadline for t-shirt design submissions is October 15th! E-mail your designs to us at lovegenevany@gmail.com. The official word from FA Church Hardware is that 200-300 people turned out for the first Cash Mob. We were hoping for fifty — we got over 200. We couldn’t be happier. But we aren’t nearly as happy as the folks at Church Hardware! They’ve reportedly written a Letter to the Editor at the Finger Lakes Times expressing their gratitude to YOU for making it happen. We’ll reprint the letter here as soon as we can. But we don’t want to rest on our laurels. There is work to do! We have two important announcements to make (the second one will be in a separate, future post). We want to see if we can make the CASH MOBS sustainable by running them every two weeks. The next CASH MOB is scheduled for 11 am – 1 pm on Saturday, Sept. 22nd at LAKE CITY HOBBY SHOP. Again, if we all show up and spend a few dollars, it will have a HUGE financial impact on the good folks at Lake City Hobby Shop. Start your Christmas shopping early and come on down on Saturday, Sept. 22nd. Thanks for all those who came out to the first Cash Mob and for doing such a great job spreading the word. Please help get the word out about the next Cash Mob! The official numbers aren’t in yet, but we do know that today’s first Love Geneva CASH MOB was a HUGE SUCCESS. The customers were pouring into FA Church Hardware steadily for two hours. Vinnie Sr and Jr were smiling ear-to-ear. They were definitely feeling the Geneva love. So a big THANK YOU to all who turned out. They were still in a daze an hour after the official end of the CASH MOB and hadn’t figured out how many people actually came in, but they knew it was well over a hundred people. When we get the figures, we’ll share them with you. The next CASH MOB is already scheduled for two weeks from today — from 11 am – 1 pm on Saturday, Sept. 22nd at LAKE CITY HOBBY SHOP. We’ll post further details in the coming days. Again, thanks to everyone who made it out.